I remained in a holiday mood for another couple of days. There was a mountain of post, 439 emails and 10 phone messages. I need a whole uninterrupted day sorting all of my correspondence out. I have had a couple of requests to teach Longarming and even do a talk so I need to jot these all down in my diary. We had Fenella’s 6th Birthday party. She is delighted with her little red sewing machine and is quite happy just sewing scraps of fabric together to make Sylvanian Family blankets and pillows. We had hoped to have a campfire and some fireworks but it was too wet. We had traditional party games in the house and dangled doughnuts from the kitchen lights. There was pumpkin soup, followed by Splodge burgers and the usual party fare of crisps and cakes. Now I need to write out some Thank You letters for Fenella to finish off. We spent Sunday moving and adjusting Milli into the newly insulated part of the workshop. It is definitely warmer in there now. This is a task that I had been dreading but we tackled it methodically and everything went back together again. I used the opportunity to put the Edgerider wheels on at last. I have had a very quick doodle and haven’t quite decided whether it is slightly stiff but it feels pretty good. I felt very rusty and in need of practice but I never feel that I do anything worthwhile on scrap fabric. I need a real quilt to make me try harder. It is tempting to move more sewing stuff into the studio but I need to leave a space to shift things when the other part of the studio gets insulation and new windows. If the postal strike allows I should have a fun quilt coming to squeeze in before a weekend of longarm tuition so that should help to blow the cobwebs away. After a very early morning flight from Edinburgh we arrived at the tiny airport in Carcassonne at 10am, picked up the hire car and stopped off at the Geant Supermarche for supplies. It was a mere 5 minute drive to the holiday house in Lavalette. 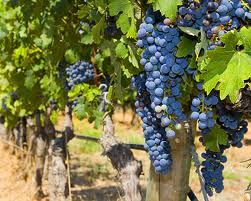 It was delightfully French with green shutters, a rear balcony and stunning views of vineyards on hills. We had a lazy day lounging around the house and reading outside in the warm sun before fetching a takeaway pizza in the evening from a small pizzeria in the village. 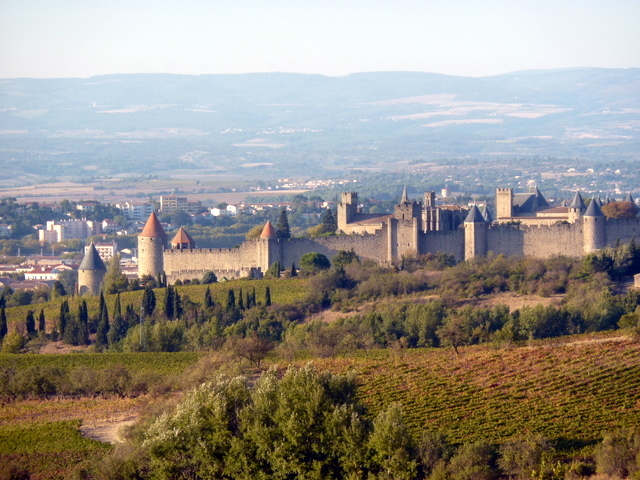 The next day we visited the restored Medieval City of Carcassonne, “La Cite”, which was surrounded by huge battlements, topped with fairy-tale turrets. The quaint cobbled streets had many outdoor cafes and small, touristy shops that sold hand-made soaps and rustic biscuits. We went on a tour of the castle with a French guide where I got the gist of the history using my rusty and basic knowledge of French. We all had delicious crepes for lunch then wandered into the magnificent cathedral. I spent the rest of the day reading “Labyrinth” by Kate Mosse and I could vividly imagine the Cathars and their prolonged siege of the old city. We visited Lac deCavayere which is a freshwater lake and reservoir used a watersports centre at the height of summer. It was bright and sunny but the air was cool so we did not venture into the water for a swim. We enjoyed a simple picnic lunch of French bread, pate and cheese then drove to Limoux where we had coffee in a market square. It was a very old town with narrow streets and most of the houses had shutters that needed a fresh coat of paint. 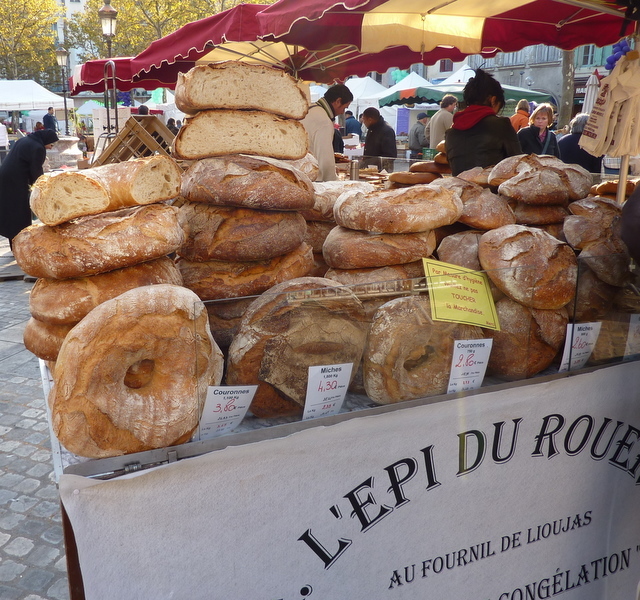 Saturday was market day in Carcassonne so we tasted all sorts of fresh produce including fromage, pain et saucisse. 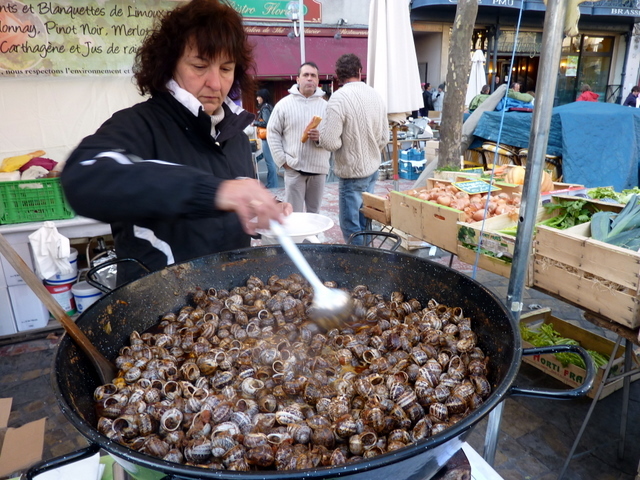 We even sampled snails but although they tasted quite like mussels, they really did look like slugs. We picked up a couple of old-fashioned aluminium stove-top cafetieres cheaply so we bought one to take home and one that we can leave at the house in Lavalette. I was sorry to finish “Labyrinth” which had been absolutely gripping and Frey was annoyed that she had speedily re-read the Harry Potter books that she had taken with her so we decided to explore Montolieu, a small town with 16 bookshops. It was a delightful village with tiny streets and alleyways. One bookshop had a marvellous bespoke staircase and many wonderful books, all of which were written in French. We returned to La Cite to have another outdoor lunch in one of the main squares. The service was leisurely which gave us plenty of time to watch everyone coming and going. Although it was sunny, it was rather cool sitting outside. Inside the cafe the decor was authentically medieval. I ordered a Toulouse sausage but I have to say that it was not as good as the ones my Dad used to buy from Soho in London years ago. It was market day in Mirepoix on Monday and we wandered around yet another beautiful medieval town. There was fantastic artisan produce, a hippy clothing stall and several eclectic shops. Our lunch was a disappointing salad and I was disappointed that I still had not found any French fabric shops. I did wish that I could take home some of the pottery bowls and casserole dishes but they would be too heavy for our limited luggage allowance. I decided that I would like to buy some French notebooks with the graph paper – there is something particularly pleasing about French stationery shops! It was a cloudy day when we made our trip towards Narbonne on the coast. Some of the towns on the way were quite scruffy. We had decided to visit the indoor swimming pool as it had slides but my husband was banned from the pool for not wearing skimpy speedos like a French monsieur. We wandered around the old Roman area of Narbonne but failed to find the patchwork shop since I managed to leave the map in the car. On the way back to Lavalette we drove through Salles d’Aude which the guide book described as a picturesque arts and crafts village on the Canal du Midi. It may be bustling in summer but we were obviously visiting well out of season as everything was shuttered up; we didn’t even manage to find anywhere that was open for lunch. We watched a boat pass through one of the canal locks before finding a small supermarket so we could have a picnic in the car. On our last day it was raining. We drove through Limoux to Quillan on the Aude river which was a town well known as a popular place for canoeists. It had a quaint square and a very small produce market. The friendly cafe was run by an Australian couple and most people seemed to be retired Brits. I eventually found a “mercerie” but it had a limited amount of patchwork fabric and sadly, nothing French or Provencal. We had coffee in a pottery studio and I picked up a few clay buttons that may be useful on a project. We shut the holiday house up and packed our bags – the suitcases were considerably heavier with the addition of a couple of bottles of wine, saucisse seche, olives and soap. 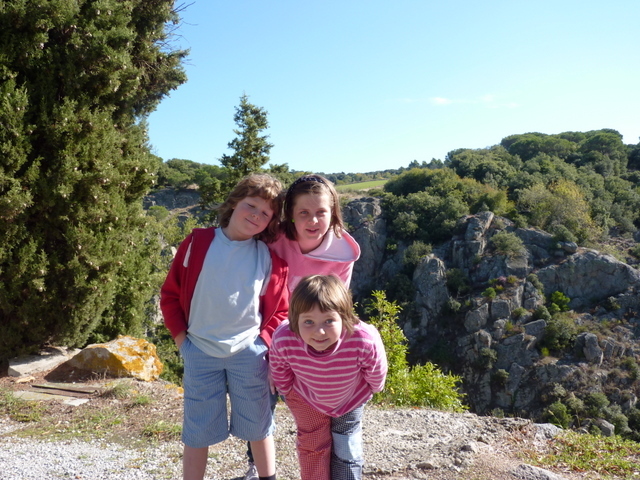 I still had not managed to persuade the family to visit a vin cave for a “degustation” so I think we will have to plan a return visit as we enjoyed ourselves so much in the Languedoc-Roussillon Region of France. 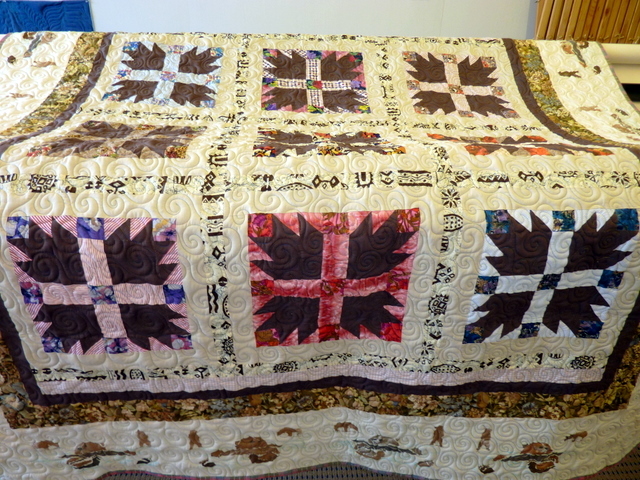 It has been one of those weeks where not much quilting has been done but lots of other useful things were sorted out. Milton Studio has had several requests to replicate the fabrics used for “Silent Movie Star”. Small shops only get a few metres of fabrics in at a time and when they finish a bolt they don’t tend to get the same again. I have had to call people and explain that while not all of the originals are still available, I can choose a selection that will work just as well. It will be fascinating to see what other people produce using similar but not identical material. Tuesday was Ginger’s Last Day and I am pleased to report that the whole operation went very smoothly. 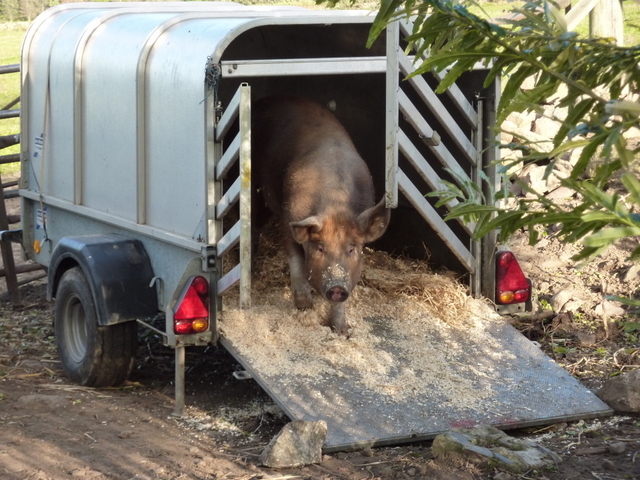 She had really taken a fancy to her new home on wheels so all I had to do was toss in a couple of apples into the trailer. I felt like a proper lady farmer as I hitched up the trailer, opened and shut various field gates and drove off to the abattoir sedately. Because I knew the way this time, I did not have to back a trailer up in any awkward places and Ginger arrived snoozing, totally oblivious to her fate. 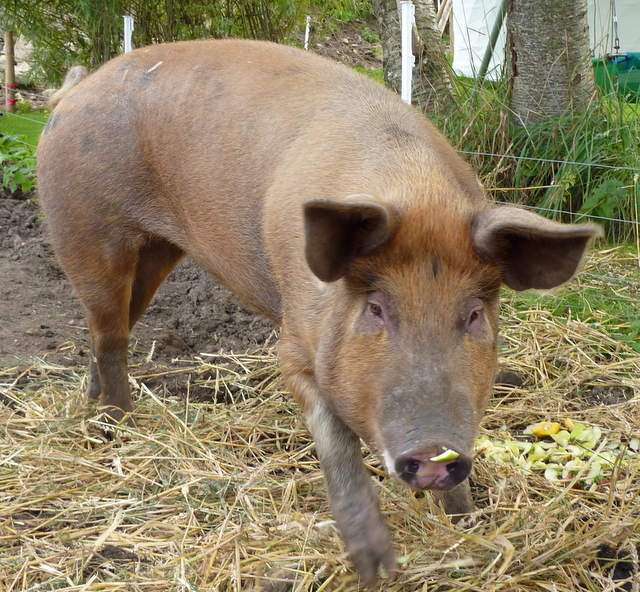 It may sound heartless but I would rather send off a happy pig than an upset one any day. George the Builder managed to put up all of the insulation boards in the smaller workshop this week. This meant that I had to reattach all of the ceiling drapery to hide all of the utility rafters and the new silver boards. I decided that I am not nearly as confident up a ladder as I once may have been. I did the job single-handed and had to shin up and down with my staple gun. I ended up with a spare length of fabric so I obviously didn’t gather it as much as I had originally. I kept looking at it critically but then reminded myself that people don’t usually walk into a room and start examining the ceiling. I had to go and buy another piece of carpet as the cheap foam-backed one had melded itself to the floor in the other workshop and would only disintegrate if moved. Mo and I were amused at the young lad who shoved the carpet into the car. He had those stupid baggy jeans that hang down so when he deposited the carpet his whole backside fell out – not an attractive look! I moved the yurt and some of the furniture through and realised that the room is not as big as I had thought. I had hoped it would be roomy enough for a second, smaller Longarm machine and an office area but it will be a bit of a squeeze. I had to go and pay a Customs ransom twice this week on parcels from USA. I can just about put up with the VAT charge but I really do object to the Post Office’s £8.00 “handling fee” on top. I have received two sets of R&S Design boards and they look great. All I need now is the stylus and the patience to try them out. I am ready to move Milli so it seems like a good time to fit the Edgerider wheels at last. I am optimistic that I might be able to tip the 14ft table and move it in one piece but I suspect that I may actually have to take it all apart. It will be a good opportunity to give the whole thing a really thorough clean and check the levels. Fergus was off school on Monday with a sore throat so instead of minding the shop at Milton Studio I gained a day to do admin and waste quite a lot of time on the internet. I even considered upgrading my laptop or looking at specifications to get another one for the children to use instead of using mine. In the end I have ordered an external hard drive to back up all of my photos and documents. Freya has started using MSN to chat to her school friends and they send each other attachments with cartoons and sounds – it can only be a matter of time before some virus tries to creep in. There was only one Hungarian trader listed in the FOQ catalogue so I gave them a call. By the magic of PayPal I have bought 15 different colours, typing their Hungarian names out carefully, and expressed an interest in being a UK reseller of the dye. It can be done on the cooker, in the microwave and in the washing machine with only the addition of 1 tablespoon of salt. It sounds wonderfully low-tech. I have been put off dyeing my own fabric before, thinking that there were too many stages and things to remember to add. I can’t wait until I can have a “Dyeing Day”! I dashed in to Aberdeen to test out the cheap sewing machines in John Lewis. The assistant tried to tell me that they don’t do demonstrations anymore but I produced my scrap fabric and reel of thread, insisting that I did not want a demonstration, just wanted to plug it in and try it out. After seeing that I would not take “No,” for an answer, she was actually pretty helpful. She advised me that the John Lewis red machine is actually made by Janome and is a later model than the 2 cheapest Janomes also available and that no-one has yet returned one as faulty. It only has one large foot and about 5 stitches but the tension was great and I decided that Fenella would be very pleased with it. The only difficulty I had was seeing to thread the needle so later on I bought a pair of bright green off the shelf reading glasses just for threading needles. The sales assistant was a bit bemused when I made her pack the display model up in the box to take home but I explained that I knew that it worked and was not now going to pick an untested one off the shelf. Since then 2 of my friends have decided that they are going to go and get one just to carry to classes but they will also annoy the sales staff by asking to plug them in and check them out. I got back in time to finish piecing the wonky circles yurt panel. Now I have several that are almost ready to quilt. I need to decide how long to make them all. I could have sworn that I measured the height of the new yurt’s trellis but will have to check with Yurt Man. My resolve to only work on yurt panels this week wavered by midweek. I did some more piecing on the Christmas mystery project which seems to be never-ending. George, the Builder came to do some more measuring and checking before ordering insulation boards and replacement windows for my workshop. He pointed out a major snag. We will have to switch off the water supply and shut off the tap which is right in the way of the new door BUT the stopcock is hidden somewhere under the ground outside. I believe that every problem has some sort of solution so I ordered a set of dowsing rods from e-bay. When I have a quiet moment I will need to train them to find what I am looking for. If that fails I know an old countryman who may be able to find it with a couple of cherry sticks. By the middle of the week I had received quite a lot of invitations to become “friends” with all sorts of people on Facebook. I have not really got to grips with Facebook yet. I can see that it could be the start of a new internet addiction checking what all your “friends” are up to. I have approved some but felt awful when I “ignored” others because I don’t actually know them –maybe they know me? It felt like shunning someone in the school playground and I’m not really sure what I am supposed to do. I daresay it won’t be long until I find out and then I will spend even less time sewing! I was meant to catch up with a George owner this week but had to cancel as I ended up minding the shop for Barbara who was waiting at home for British Telecom. This meant that I had not now gained a day as I had thought on Monday. Thursday was very cold and the shop was not particularly busy so it gave me plenty of time to think about a couple of simple yurt panels. It would be great to make them all hopelessly elaborate but I don’t think I will have enough time. Perhaps I should make more than I need and then choose. I fiddled around cutting some sashing strips for the Flying Geese blocks and decided that I should cut up some small pieces to have as portable projects such as yoyos or covered buttons. Next I decided that maybe I should get a Dremel tool and make my own carved buttons out of antlers and thin slices of wood so I have been reading reviews about them on the internet to help me make up my mind. On Friday I decided to bite the bullet and clear my inner studio out for George the Builder to start on the insulation so I can move the Longarm. Although I am dreading taking it apart and reassembling, it will be good practice if I need to take a frame to a show or set a system up from scratch. I also got started on the Bear quilt. I had planned to quilt some watery lines in the outer border but the patched and mitred corners would have made it look awkward. The client provided very fat poly wadding so I decided that allover medium swirls would be the best option in this case. I drove down to Stirling with the family on Saturday. I attended a Regional QGBI meeting to discuss Regional quilting events up to 2014 and they went to the castle for the day. I have to compile a list of possible tutors for the Stirling Residential weekend in 2011. We met some gale force winds on the way down. By the time we got home all sorts of things had been blown all over the place. Sunday morning was spent clearing up all the debris in the garden. A few branches broke off the trees and the flowerpots had all tipped over. I had to make adjustments to the yurt which had shifted considerably. A table had been knocked over and a jug got smashed. The cover had lifted and there were leaves and twigs to sweep up inside. The cat had opened the summerhouse door by jumping on the door handle so chairs and papers were strewn about in there too. It was a beautiful autumn day and it was really satisfying to spend some time outside tidying up.